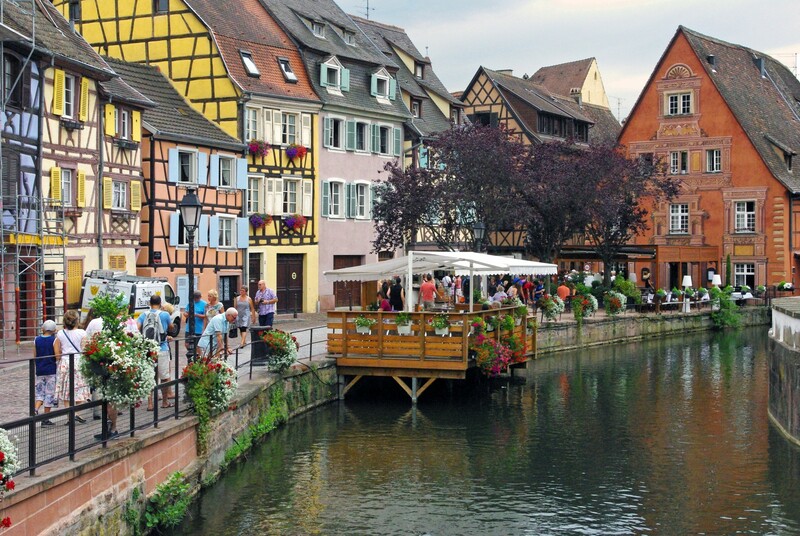 At the heart of the Alsace Wine Route, Colmar is very well located and while it may not be the capital of Alsace, it remains one of its top tourist destinations. 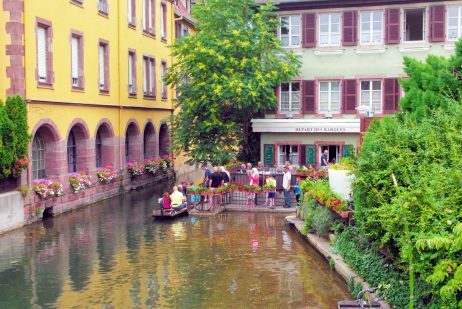 The Colmar Little Venice district in the old town gathers colourful half-timbered houses neatly lining cobblestone streets and walkways, set along a peaceful canal. In the Krutenau district, the city gives way to the village atmosphere that is typical of traditional Alsace. 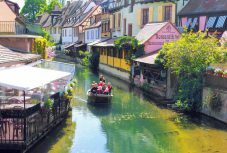 Those with an affinity for half-timbered houses will once again be charmed by the sight of the district, which is adjoined by a stream – the Lauch – which earned it the name of the “Little Venice of Alsace”. In reality, it would be more accurate to call it “Little Bruges” because, unlike in Venice, there is only one river serving the neighbourhood: the picturesque Lauch. The little 45 km long river runs from the Vosges and crosses the town of Guebwiller, before entering the Alsace Plain. 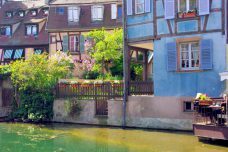 It flows into the River Ill in the outskirts west of Colmar. At the crossing of the Krutenau district, the Lauch was used by the market gardeners, fishmongers and tanners who passed through there in small, flat-bottomed boats. Start the walk at Place de l’Ancienne Douane. The fountain is from Bartholdi and represents Lazare de Schwendi (1522-1583), a general of Charles V, Holy Roman Emperor. Follow the canal that borders rue des Tanneurs where tanners used to work and live. Observe the tall half-timbered houses topped with attics where animal skins were put to dry. Cross the bridge and turn right on Quai de la Poissonnerie. 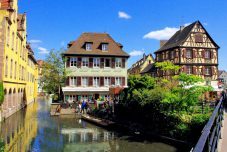 The first stop in the tour of the Little Venice of Colmar is the Quai de la Poissonnerie (Fishing Quay), accessible by a small bridge that crosses Rue des Tanneurs. There, fishermen sold fresh fish that had been caught in Colmar’s waters. The brightly coloured, little half-timbered houses belonged to the members of the powerful fishing corporation. Across the canal stands the Covered Market hall of Colmar (1865), one of the best of its kind in Alsace. The Quai de la Poissonnerie is continued by the rue de la Poissonnerie. The narrow street leads to Rue de Turenne, site of the old “Krutenau” (the fruit and vegetable market). The little Krutenau district, beginning in Rue de Turenne, features a strong village atmosphere, and was once inhabited by the market gardeners corporation. Admire the view from the nearest bridge: Pont de l’Abreuvoir. Continue the tour by walking along Rue de la Herse. From the past, Rue de la Herse has still kept intact a village atmosphere. At the end of rue de la Herse, turn right at Passage de la Petite-Venise. You’ll walk along the boardwalk at the edge of the Lauch. 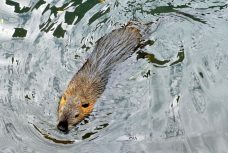 In summer, otters can often be seen here! The flat-bottomed boats that once cruised along the Lauch allowed market gardeners to display their fruits and vegetables. Today, the small gondolier boats pay homage to this long-forgotten activity, giving Colmar a Venetian feel. You can board boat tours of the Little Venice district from underneath the Saint-Pierre Bridge. The boat tour is a wonderful opportunity to discover the string of beautifully restored houses dating from 1350 to 1609. We recommend the cruise by Sweet Narcisse. The stunning view of the district from the Saint-Pierre Bridge, to the far south of Little Venice, is one of the most photographed views of Colmar. Busloads of tourists stop here to allow visitors to admire the view of the river reflecting the old half-timbered houses. At the Saint-Pierre Bridge, turn right and follow Saint Pierre Boulevard until the intersection with Rue du Manège. Take the road to the right until you reach Place des Six-Montagnes-Noires. The square of Place des Six Montagnes Noires features the Roesselmann fountain from sculptor Bartholdi (1888). The name of the square (Six Black Mountains) refers to an old inn that once bordered the square. Continue walking on rue Saint-Jean. At number 3 stands the St. John’s Knights House (Maison des Chevaliers de Saint-Jean) with its refined galleries evoking an Italian palazzo. Reach Place du marché aux fruits. the Kern house, a beautiful Renaissance edifice built in 1594 with a fine Dutch gable. the Regional Court (Tribunal de Grande Instance), a Neo-Classical building (1754-1771). The Old Customs House is at the other end of the square. Reach rue des Marchands and continue exploring the old town of Colmar around the Pfister House! Check out the website of the Tourist Office of Colmar. 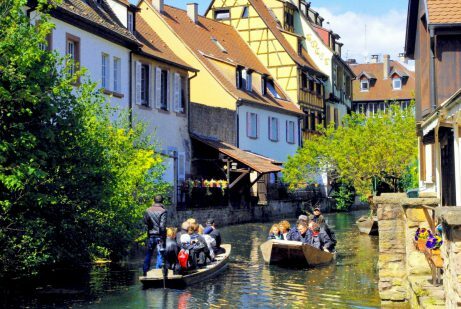 Read more about the Colmar Little Venice on our French blog! The barge cruise in the Little Venice by Sweet Narcisse. I and my wife saw the Colmar’s photos. They were dreamy for us. I can’t stop imagining the town even before going to sleep at night and after waking up in the morning. We are really sad not able to visit such a dreamy town. We live in Mehrshahr, Karaj in Iran. My town is also beautiful but Colmar is something else. Thank you for your nice photos! Thank you for taking the time to write a little feedback on Colmar! Have a pleasant day and hope to see you soon on our website!